"The greatest freedom is to believe in yourself." Believe Perfume by Britney Spears, launched 2009 by Elizabeth Arden. "Sensual and warm. Delicate and feminine. A sparkling blend of exotic fruits, soft florals and seductive amber." Available in 1.0oz, 1.7oz, 3.3oz Eau de Parfum Spray, 6.8oz Body Souffle, 3.3oz Shower Gel, and Shimmer Powder. Sensual and warm. Delicate and feminine. A sparkling blend of exotic fruits, soft florals and seductive amber. Inner light shines outward with a mouthwatering top note of guava pulp and golden tangerine. A delicate blend of feminine honeysuckle is intertwined with hints of linden blossom. Discover beautifully sleek, scented skin with this sensual body souffle. The greatest freedom is to believe in yourself. We all have beliefs that are treasures in our soul. Some are fun with a superstitious twist, others are words to live and love by, the remainder serves as inspiration when we need it the most. The Bottle - Inspired by a simple triangular shape, the modern, peridot colored bottle has a striking silhouette. Its multifaceted design represents Britney's many beliefs. The Carton - Sleek and modern. 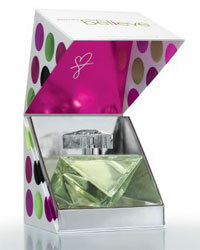 The clean, bright white carton is accented with vibrant pink, magenta and green metallic dots symbolizing beliefs about inspiration, love, fun and life.